Sportiness in pure form combined with a Panamera. The Porsche engineers are compelled to push the standards higher. Perhaps it is this obsession mixed with pure, unadulterated driving pleasure that led them to create the Panamera GTS. craf ting of highly ef ficient sports cars. further advances in this respect. with a clear focus on performance. 2 emissions, please refer to page 49. The face that stands out in the crowd. as a border for the indicators. wheels are finished in high-gloss black. only upwards but out wards, too. black, it creates a sportier effect. touch to the overall appearance. are all finished in Alcantara. Carmine Red or GT Silver. your anticipation as you step inside. for yourself. In the meantime, we’ve compiled some facts and figures for you. Why is your pulse racing all of a sudden? sides of the front apron respectively. inders temporarily during each gearshift. with that of a manifold injection system. switches the lift of the intake valves. valve lifts and retarded timing. SPORT PLUS mode is activated (p. 28). featuring tailpipes painted in matt black. to deliver ef fective emissions control. of the other Panamera models. even at high road speeds. 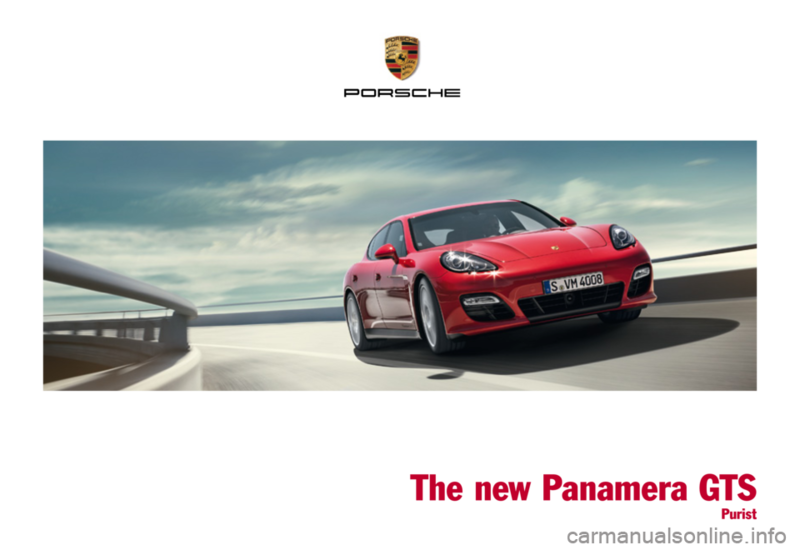 Panamera GTS, we’ve made PDK sportier. to achieve best possible acceleration.